The last weekend in July sees Tom Cruise’s first film in a year, ‘Mission: Impossible – Fallout’, come up against a nice dose of counter-programming in ‘Teen Titans Go! To The Movies’. While it’s inevitable that ‘MI6’ will cruise to a win against the animated comedy (and to first place this weekend), the real question is, what will this film open to? After the semi-death of the ‘Transformers’ franchise last summer (although its reboot this December may mean there’s life in it yet), Paramount’s only real profit-churning franchise is the ‘Mission: Impossible’ series. They’re a group of films that have all increased steadily in budget with each sequel, but have opened to a high of just $57.8m, achieved 18 years ago with ‘MI2’. The same film earned the franchise’s biggest domestic gross of $215.4m, while Brad Bird’s 2011 release ‘Ghost Protocol’ made $694.7m worldwide — the highest to date. 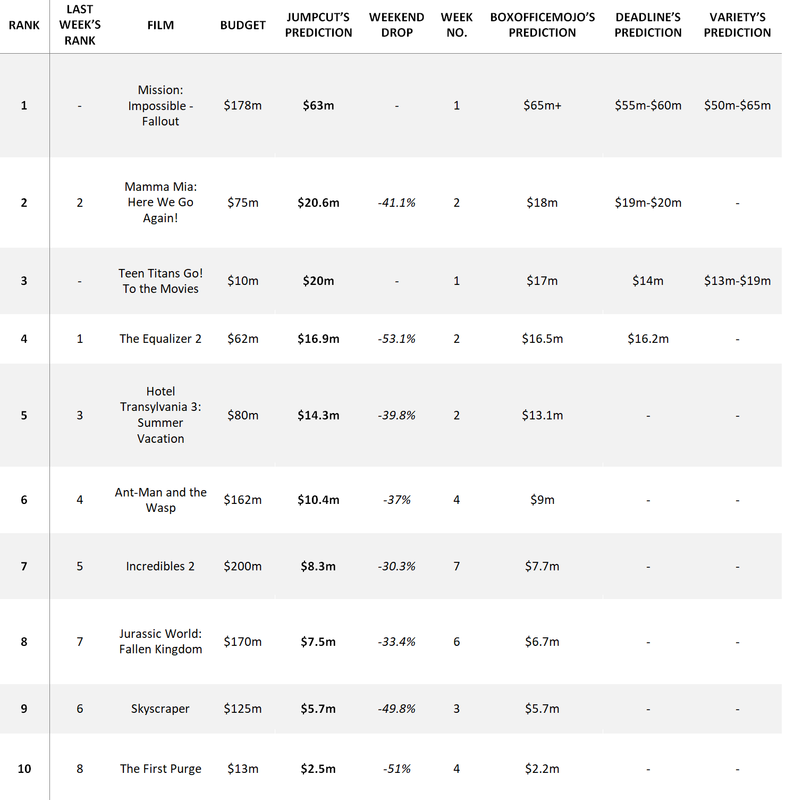 Now, with a production cost of at least $180m (Cruise’s injury actually ballooned the budget to well over $200m, but an insurance payout deflated this), ‘MI6’ needs to be the franchises big breakout, and boy do they deserve it. ‘MI6’ is coming after two films with a 93% rating on the Tomatometer, and its own 98% (and 86 on Metacritic) means it’s supposedly the best yet. ‘MI6’ sees Cruise back as the iconic Ethan Hunt; alongside Ving Rhames, Rebecca Ferguson, and Simon Pegg, we see Angela Bassett and Henry Cavill added to the Impossible Mission’s Force — and, hopefully, we’ll also see it becoming the first film to do the impossible and open to over $60m. We’re foreseeing a $63m gross, which’ll serve as Cruise’s second biggest opening, just behind ‘War of the Worlds’ in 2005 ($64.9m). It’ll be another second place finish for ‘Mamma Mia 2’, as it aims for a similar drop to 2012s ‘Les Miserables’, to bring in around $20.6m. Just behind will be one of 3 animations in the top ten, ‘Teen Titans Go!’, which proved quite difficult to predict. Based on the TV show, and starring beloved superheroes like Robin, Cyborg, Raven, Batman, Wonder Woman, and Nicholas Cage (!) as Batman, this could go as high as ‘The Lego Movie’ ($69.1m), or as low as, well, anything. Its 88% on the Tomatometer hints towards the former and a $10m budget means a small opening may not spell trouble, but it’s most likely that these young bucks will fight their way to a $20m opening. After the shock debut of Denzel Washington’s ‘The Equalizer 2’ last week, it’ll be back to normal in the next 3 days with a 50%+ drop, to post just under $17m. The introduction of ‘Teen Titans Go!’ may lead to some audience crossover with ‘Hotel Transylvania 3’, but the latter should hold strong to earn over $14m, clear of ‘Ant-Man and the Wasp’s $10.4m. The MCU sequel will pass the domestic gross of 2015s ‘Ant-Man’ this weekend and could even pass the entire worldwide gross of Disney flop ‘Solo: A Star Wars Story’, if its international markets perform well. ‘Incredibles 2’ will continue its superb run as it closes in on the $1bn worldwide mark with over $8m this weekend, just ahead of ‘Jurassic World 2’ with $7.5m. Finally, ‘Skyscraper’ and ‘The First Purge’ round off the top ten, looking to gross $5.7m and $2.5m each. Is ‘Teen Titans Go!’ to become a hit like ‘The LEGO Movie’? Will ‘MI6’ hit that magical $60m mark, or will it fall just short like the rest? Let us know your thoughts on Twitter and Instagram – we’re at @JUMPCUT_ONLINE.